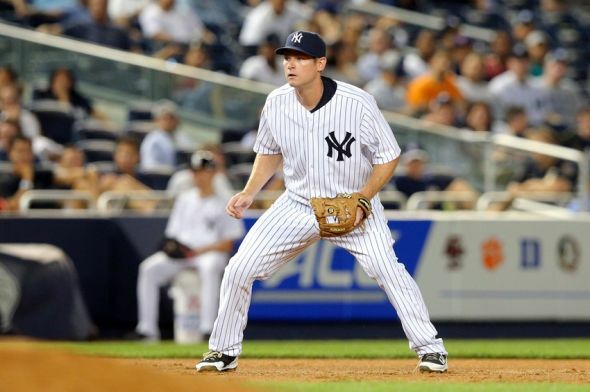 Chase Headley playing third base. Chase Headley, who was acquired at the trade deadline last season, was re-signed by the Yankees to a four-year, $52 million contract. He is a 30-year-old third baseman who hit .243/.328/.372 last season in 135 games with the San Diego Padres and Yankees, but in 58 games with the Yankees after being traded, he hit a much better .262/.371/.398 with six homers, 17 RBIs and eight doubles. He played in 77 games with the Padres and 55 with the Yankees and had almost the same amount of homers (7 and 6) and doubles (12 and 8) in 22 fewer games. His average while playing for the Yankees was also much better than when he played in the National League with the Padres. The Yankees had to resign Headley because he proved that he was able to improve his stats while playing under the bright lights and he makes and his return entails that the defense in the infield will be elite at first base, shortstop, third and catcher. He was productive with the Yankees and liked being in New York City. He makes their defense much better than it would have been without him. Headley also admitted that he took a discount to stay with the Yankees, which proves that he appreciates that the Yankees traded for him last July and desperately wants to play in the playoffs. Stats that prove how important bringing back Headley is for the Yankees are that as a Yankee, he was 7th in OPS, 11 in slugging, 7th in times on base and 5th in OBP among all third baseman. He is an elite defender and is an abover average hitter for a third baseman. His signing also ensures that Alex Rodriguez will have little value to the Yankees in 2015. If A-Rod is healthy and somewhat productive, he should get at-bats at DH and will possibly be a back-up first baseman. Headley, who hit 31 homers and drove in 115 runs in 2012 when he finished fifth in MVP voting and won a Gold Glove and Silver Slugger award, has not come close to having a season like that since, but his chances at repeating his success from 2012 are improved this upcoming season based on how he played after the All-Star break and the increased protection that he has in the Yankees lineup. The Yankees will be dramatically improved defensively as well as to a lesser extent on offense at the second base, shortstop and third base positions in 2015. Martin Prado is now slated to be the everyday second baseman, and he should be much better than Brian Roberts, who was the primary second baseman last season. Didi Gregorius isn’t better than Derek Jeter in his prime, but he has much more range than Jeter had the past few seasons and even had a better OPS than Jeter did last season. Yangervis Solarte and Kelly Johnson played third before Headley’s arrival, and they don’t combine to be nearly the player that Headley is. The infield defense will prevent more runs from scoring than last season, which will be important based on the pitching staff that the team will have. Another benefit to Headley and the Yankees agreeing on a deal is that Rob Refsnyder will be able to get some more seasoning at AAA-Scranton to improve his defense at second base and then can get called up in June. Refsnyder is an elite second base prospect who hit .297 with 24 homers and 142 RBIs in three minor league seasons, but he really started to make everyone pay attention to him last season when he .318 with 14 homers, 63 RBIs and nine steals while playing 60 games at AA Trenton and 77 games a AAA Scranton. Refsnyder has to improve his defense, and he did last season as he nine errors for Trenton but only three while playing for Scranton. He played outfield in college, and that versatility will make him valuable at either second or outfield since it is likely that Carlos Beltran will miss some time next season because of injury. The Yankees envision Refsnyder as their second baseman of the future, and with Headley’s return and Prado’s move to second, he will not feel the pressure in spring training of starting the season at second. Headley thinks that coming to New York and having dangerous hitters around him made him a better hitter. He said that a major reason that he signed with the Yankees is that he wants to win and the Yankees offer him a better chance to do so than the Padres ever did. He proved to have a flair for the dramatic as he hit a walk-off hit in extra innings in his very first game as a Yankee. He will try to give fans many more moments like that during the years to come. The next move that the Yankees need to make is adding a dominant starter. They reportedly don’t want to give Max Scherzer the contract that he wants, but that could change. The Yankees lost 9-3 to the Cleveland Indians on Thursday night at Progressive Field. The Yankees were on track to win the game with a 3-0 lead in the top of the seventh after scoring two runs in the fourth and one in the fifth, but the previously reliable bullpen allowed nine runs combined in the seventh and eighth. David Phelps, who had only allowed three runs combined in his previous two starts, continued his improved pitching as he only allowed two runs in six innings pitched. However, it could have been zero runs in six innings if Matt Thornton would have prevented Phelps’s two inherited runners from scoring in the seventh. Thornton hadn’t allowed a run in his previous nine appearances, but his ineffective pitching led to a loss for the Yankees. Manager Joe Girardi was impressed by how Phelps pitched and was disappointed that they couldn’t get the win for him. “He threw pretty well,” Girardi said. “It is unfortunate that we were not able to win the game for him. He has been really good. He has been on a little bit of a roll for us, which is important. Phelps gave up a single to Chris Dickerson and Roberto Perez’s first career hit in his first game before being taken out of the game. Thornton allowed those two runners to score and allowed two runs of his own as Asdrubal Cabrera hit a triple to right that scored three runs and Michael Brantley hit a sacrifice fly to center that scored Cabrera. Perez also hit his first major league home run in the eighth inning. His two-run blast off of rarely used reliever Jim Miller to made the score 6-3. The Indians would score three more runs in the frame off of Miller, highlighted by a 394-foot two-run homer by Carlos Santana. Girardi could have left Phelps in longer, but Phelps had thrown 103 pitches after allowing those two consecutive singles. The Yankees struggles with runners in scoring position continued as they were only 1-5 in those situations. In the first inning, Francisco Cervelli, who has hit well with the bases loaded in his career, struck out with the bases loaded and two outs. Yangervis Solarte, who was recalled from AAA Scranton before the game since Carlos Beltran was put on the 7-day concussion disabled list, had a single to left to score Cervelli for the team’s only hit with RISP. The Yankees scored their other two runs off of a two-run homer by rookie Zelous Wheeler. This was his second homer in his first 18 at-bats since being brought up from AAA Scranton. 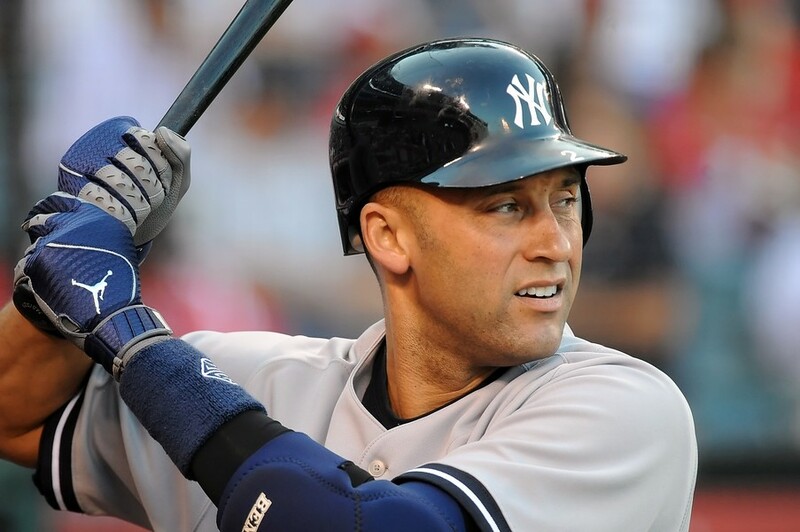 Derek Jeter, who was 2-4 in the game, now has 1,000 career multi-hit games. It is yet another milestone in his Hall of Fame career. Masahiro Tanaka will now be out for at least six weeks with a partial tear of his UCL. 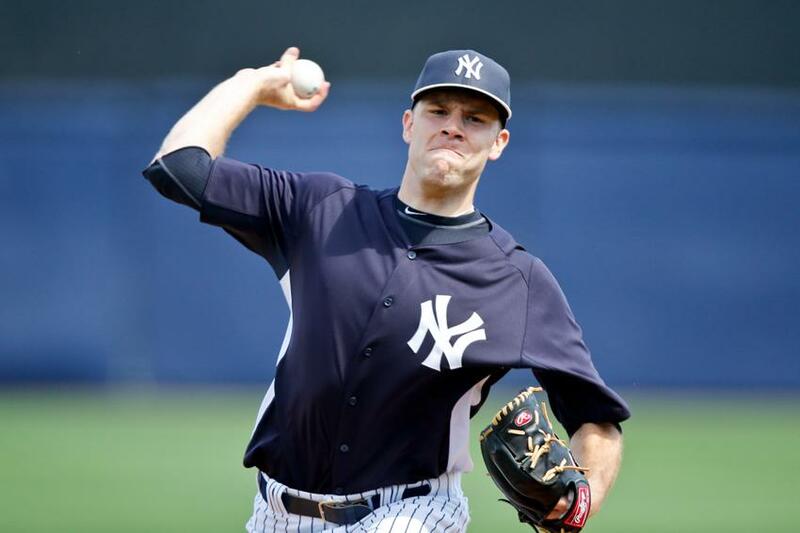 He will have a PRP injection in the coming days, and Brian Cashman said that Tommy John surgery could be an option. This very much hurts the rotation as he has been by far the team’s best starter so far. Cashman has said that they will try to improve the team before the trade deadline, which means that he will likely add another starter since 80 percent of the rotation to begin the season is on the disabled list. They loss meant that they split the series with the Indians, with the Yankees winning the first and third game and the Indians winning the second and fourth. The Yankees bullpen had a 1.75 ERA in their previous 16 games, and part of the reason the bullpen gave up so many runs last night was because the most reliable options were not available as a result of Wednesday’s 14 inning game. The team is now four games behind the Baltimore Orioles before they start a three-game series in Baltimore on Friday. Vidal Nuno pitching last season during spring training. The series finale that the Yankees were supposed to play in Kansas City against the Royals at 8:10 EST was postponed because of rain. Monday’s game will now be played on Monday, August 25. The rainout will lead to the Yankees returning to Kansas City the day after their series against the Chicago White Sox ends in the Bronx and before they start a three-game series in Detroit. The Yankees (31-31) had the opportunity to end the series on a positive note with a series split, since a victory would have meant they would have won the first and fourth games of the series, but the Yankees ended up losing two out of three games to the Royals, who are now 31-32. In addition, in their last 10 games the Yankees have only gone 3-7, and have averaged only 2.5 runs in those games. Put in different terms, the Yankees have scored more than four runs only once in their previous 11 games. With three out of their five starters coming out of spring training currently on the disabled list, it seemed like starting pitching might have been the main issue, but scoring has been by far the major weakness. Brian McCann, Alfonso Soriano, Brian Roberts, and Derek Jeter have all not hit like they are capable of. The Yankees are currently 22nd in all of baseball in runs scored (249), 18th in on-base percentage (.315) and 18th in slugging percentage (.382). They surely are not living up to their Bronx Bombers nickname right now since Mark Teixeira (10 homers) is the only player who has hit more than seven homers. Brian McCann, Yangervis Solarte and Teixeira are the only players with more than 25 RBIs after 38 percent of the season has gone by. Also, Solarte, who was the last player to make the roster out of spring training and had previously only been in the minor leagues, is leading the team in average (.299), RBIs (28) and on-base percentage (.368). The AL East has struggled as a whole, as the Baltimore Orioles are in second place with a 32-20 record. The Toronto Blue Jays, who have been the biggest surprise in all of baseball, are in first place with a 39-26 record as a result of the best offense in the league and a pitching staff that has performed much better than expected. The Tampa Bay Rays, who were expected to finish first or second in the division, have the worst record in baseball largely because of injuries and players that have underperformed. Rounding out the division is the Red Sox, who after winning the World Series last season, were due for a regression, and that is exactly what has happened as they have a 28-35 record and are 4-6 in their last 10 games. The Yankees will now be starting a six-game series on the west coast with three games against the Seattle Mariners (34-29 after winning eight of their past 10 games) and three games against the Oakland Athletics (39-25). Oakland’s record a half-game better than Toronto’s for the best record in the American League. The Mariners and Robinson Cano previously won three games at Yankee Stadium and the Yankees will be facing their former All-Star second baseman for the first time at Safeco Park. To try and keep pace with the Orioles and Blue Jays, it is important that the Yankees go 3-3 or better on this road trip. The Yankees will be facing five very good pitchers in their next six games including Hisashi Iwakuma, Roenis Elias, Sonny Gray, Scott Kazmir and Jesse Chavez, but the offense needs to find a way to take advantage of when the pitchers don’t execute their pitches. In the first game of the series against the Mariners, at 10:10 PM EST on Tuesday, Vidal Nuno will pitch for the Yankees and Iwakuma will pitch for the Mariners. Nuno, who has a 5.33 ERA on the season while relying on off-speed pitches, allowed two runs in 4.2 innings pitched in his last start while not being able to keep his pitch count down. In three previous starts against the Yankees, Iwakuma has one win and a 3.18 ERA. In Game Two, Masahiro Tanaka (9-1) will pitch for the Yankees and the 6-10 righty Chris Young will start for the Mariners. In Game Three, Chase Whitley, who impressively has a 2.42 ERA in five starts, will try to win his second game as a Yankee. Elias, the rookie from Cuba, will pitch for Seattle. 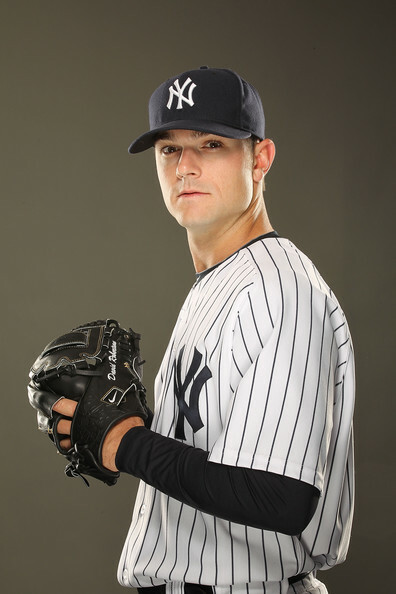 After blowing his first save of the season in last night’s 6-5 loss to the White Sox, David Robertson rebounded with three strikeouts in the 10th inning to record his tenth save of the campaign. If the Yankees win tomorrow’s game they will have split their six games in Chicago against the Cubs and White Sox. The Yankees won their first game at U.S. Cellular Field since August of 2011. They previously had an 8-game losing streak on Chicago’s south side. They were able to win this game in extra innings as a result of collecting only three hits through eight innings and then scoring four runs off of five hits in the ninth and 10th innings combined. 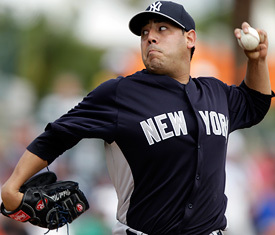 Vidal Nuno gave the Yankees seven solid innings while allowing all three of his runs in the first inning. He allowed nine hits, one walk and five strikeouts. Nuno rebounded well from his shaky first inning and pitched seven innings for the first time in his career. Nuno, who was pitching in the independent Frontier League before the Yankees signed him in 2011, allowed the three runs in the first off of an RBI double by Dayan Viciedo, a sacrifice fly to center by Adam Dunn and a groundout to Derek Jeter by Alexei Ramirez. Location is key for him and he was able to throw his pitches where he wanted to after the first inning. It was key that he was able to throw a career-high 101 pitches in this start because it gave the bullpen a break. Dellin Betances came in for the ninth inning and ended up with his third win of the season. He struck out two of the three batters that he faced and managed to throw eight of his 10 pitches for strikes. He has been able to control his slurve and fastball with pinpoint accuracy, which has helped him pile up 49 strikeouts, only allow nine walks and have a very impressive 1.59 ERA. The Yankees were six for 33 with runners in scoring position coming into the game, but with their clutch hitting in the ninth and tenth innings, they were able to improve on that ineptitude by going three for six Saturday afternoon. 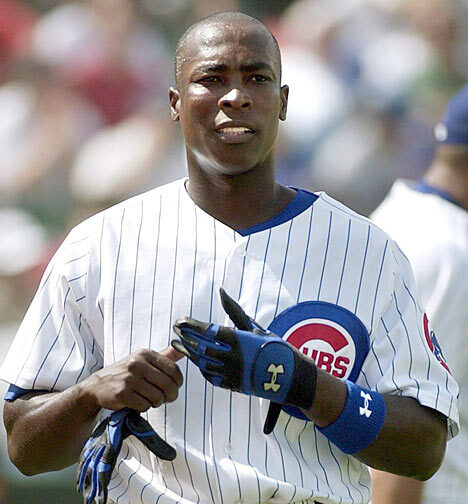 In the ninth, Alfonso Soriano’s ground rule double to right scored Jacoby Ellsbury for their first run of the game. Then Yangervis Solarte‘s single sent Soriano home. That was Solarte’s team leading 25th RBI of the season. To tie the game, Brian McCann’s single to center scored pinch-runner Kelly Johnson. In the tenth inning, after Derek Jeter grounded out to second, Ellsbury’s second homer of his season put the Yankees ahead 4-3. The Yankees scored all of their runs in the ninth and tenth innings with two outs. Ellsbury went 2-5, with two runs scored and the homer, after previously having two hits in his previous 22 at-bats, so this could be a sign of him coming out of his slump. In this game, Jeter moved ahead of Luis Aparicio for second place in the all-time games played list at shortstop. He is now played 2,584 games at the shortstop position, which is second only to Omar Vizquel. After two close losses, Girardi was happy to get a win, even if it meant going into extra innings. “The way this road trip has went, we will take wins any way we can get them,” Girardi said. The Yankees will close the series against the White Sox with a 2:10 EST game on Sunday. Masahiro Tanaka, who is coming off of his first loss since the 2012 season in Japan, will pitch for the Bronx Bombers and Andre Bienzo, who is from Brazil, will pitch for the White Sox. 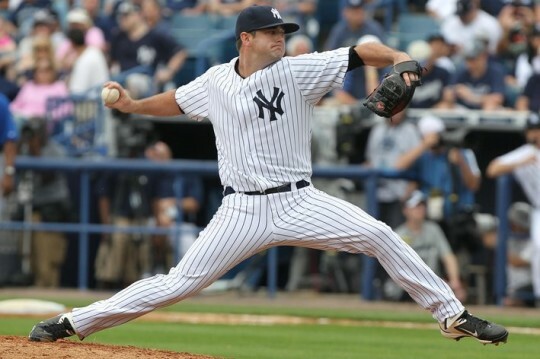 Preston Claiborne pitching last season for the Yankees. On Wednesday, the Yankees won the second and final game of the series against the Cubs at Wrigley Field. After losing the first game 6-1 after Tanaka allowed three earned runs and picked up his first loss since August of 2012, the Yankees won in 13 innings on Thursday as Preston Claiborne picked up the win as he pitched 1.2 scoreless innings and executed a perfect sacrifice bunt in his first MLB at-bat. After Jeff Samardzija had yet another outstanding start but did not get the win as a result of the Yankees scoring two runs in the ninth to tie the game, Matt Daley, Matt Thornton, Claiborne and David Robertson, who picked up his ninth save in as many chances, combined to only allow two hits in four innings. Chase Whitley, who was making his second start, held his own once again as he allowed one run in 4.1 innings while striking out three. Dellin Betances came on in relief of him to pitch 1.2 perfect innings and add three more strikeouts. He now has an impressive 45 strikeouts in 26 innings. In the ninth inning, when the Yankees were losing 2-0, Ichiro Suzuki scored after grounding into a fielder’s choice to the shortstop and then Brendan Ryan scored the tying run after defensive replacement Darwin Barney made an error throwing to first. The Yankees came through in the clutch off of Cubs closer Hector Rondon. The offense came up big once again in the 13th inning. After Ryan singled to leadoff the inning and Yangervis Solarte walked, Claiborne’s perfectly executed sacrifice bunt in front of the pitcher advanced the runners to second and third with two outs. Ryan, who came into the game in the ninth inning, scored the winning run on a wild pitch by former Yankee Jose Veras, and John Ryan Murphy’s single sent Solarte home from third. Murphy is now hitting an impressive .406 in 32 at-bats. Solarte, who had two hits in four at-bats and scored that insurance run, improved his average to .317. He is still leading the team in average, on-base percentage (.394), RBI (24) and total bases (70). The Yankees (24-21) would not be in first place in the American League East without Solarte, who had previously spent his career in the minors in both the Minnesota Twins and Texas Rangers organizations. The Yankees will now move onto the south side of Chicago where they will play the White Sox for four games at US Cellular Field. Thursday’s game will be at 8:10 p.m. EST. The White Sox, who have a 23-25 record and have lost three of their past five games, are third in MLB in runs scored, seventh in batting average and seventh in slugging percentage. However, the White Sox are now without impressive rookie Cuban slugger Jose Abreu, who is out indefinitely with an ankle injury. He was leading the team in homers (15), RBI (42), and runs scored (29). He is also currently leading the AL in homers and RBI. The Yankees are lucky that their depleted pitching staff will not have to face him in this series. On Thursday night, White Sox ace Chris Sale will make his return from the disabled list. His last start came on April 17 when he allowed one run in seven innings to the Red Sox. Sale had a 1.23 ERA in two starts against the Yankees last season. For the Yankees, David Phelps will get his third start of the season since Michael Pineda was put on the disabled list. Phelps has allowed one, four and zero earned runs respectively in those three starts. His best start came on May 17 against the Pittsburgh Pirates as he struck out a season-high five batters and walked three in five scoreless innings. He was able to earn his first win of the season. On Wednesday it was revealed that Pineda, who is on the disabled list as a result of a back strain, is making progress and looked comfortable during a 30-pitch bullpen session on Wednesday at Yankee Stadium. This obviously means that he has not suffered a setback, which is a good sign. The starting pitcher on Friday for the Yankees will be Hiroki Kuroda (3-3, 4.61 ERA), and the starter for the White Sox will be former Yankee Hector Noesi (0-3, 5.32 ERA). On Saturday, at 2:10 p.m. EST, Vidal Nuno (1-1, 5.82 ERA) will face John Danks (3-4, 5.64 ERA). In the series finale, at 2:10 p.m. EST on the YES Network, Andre Rienzo, who is a rare baseball player from Brazil, will get the start for the White Sox. Masahiro Tanaka (6-1, 2.39 ERA), the rookie sensation from Japan, will look to bounce back from his first loss of the season. This will be the first series that the Yankees have played against the American League Central this season.